Stars of Birmingham Hippodrome’s high-flying pantomime adventure, Peter Pan arrived at the theatre for a first glimpse at the festive family spectacular coming this December. 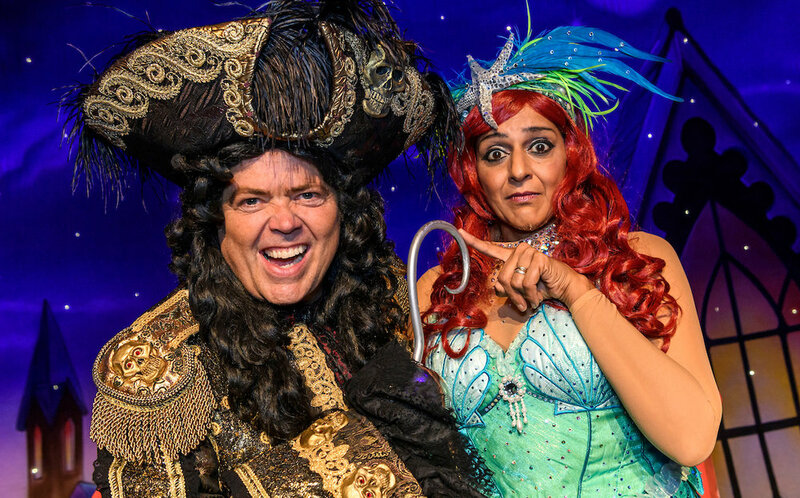 Jimmy Osmond, Meera Syal, Matt Slack and Jaymi Hensley posed in full costume ahead of the swashbuckling production sailing into Birmingham from Wednesday 19 December. In a career that has spanned four decades, Jimmy Osmond is the youngest member of The Osmonds, the American family music group who dominated the music industry in the 1970s. With hits including One Bad Apple, Crazy Horses and Love Me for a Reason. Jimmy also became the Guinness Book of Records’ youngest ever artist to achieve a UK number one single Long Haired Lover from Liverpool. As a solo artist Jimmy has received six gold records, one platinum record and two gold albums. Jimmy has appeared on several UK television shows including I'm a Celebrity... Get Me Out of Here!, All Star Family Fortunes, Celebrity Come Dine with Me, Popstar to Operastar and was a finalist in last year’s Celebrity Masterchef. In addition to television work Jimmy has starred in Joseph and the Amazing Technicolor Dreamcoat, tours of Chicago (including at the Hippodrome), Boogie Nights and Jimmy Osmond’s American Jukebox Show and various pantomimes across the UK. Jimmy will star as Neverland’s nastiest resident, the crocodile-fearing, Peter Pan-despising, left-hand-lacking Captain Hook. Comedian, writer and actress Meera Syal makes her pantomime debut as the Magical Mermaid. West Midlands-born Meera is best known for her television work including writing and performing in the iconic BBC comedy Goodness Gracious Me and played Sushila in the International Emmy award-winning series The Kumars at No. 42 which ran for seven series. She went on to star in Beautiful People for the BBC, played consultant Tara Sodi in Holby City and appeared in two episodes of Doctor Who. Meera has recently starred in The Split for the BBC as Goldie. On stage Meera recently completed a four-month stint as the evil orphan owner Miss Hannigan in the West End production of Annie, and previously starred in the title role of the one woman show Shirley Valentine at the Menier Chocolate Factory. In 1997 she was appointed the MBE, and in 2015 received the CBE for services to drama and literature. Back for his sixth consecutive Hippodrome pantomime, Birmingham’s most popular entertainer Matt Slack returns to his pantomime home to star with them as Smee. Matt has won legions of fans making thousands of Midland panto audiences laugh each and every year with his trademark physical comedy, adlibs and local references. Starring as Peter Pan, Union J star Jaymi Hensley makes his Hippodrome debut. Having trained at the prestigious BRIT School for Performing Arts Jaymi joined the boyband Triple J in 2011, a popular trio who entered the ninth series of ITV’s The X Factor. With an additional bandmate the band reformed as Union J winning over the judges and audiences and coming fourth in the annual television talent competition. Since then Union J went on to great success releasing the popular hit singles Carry You, Tonight (We Live Forever) and You Got it All as well as two studio albums, their self-titled top ten album Union J and You Got It All – The Album. Last year Jaymi reached the semi-finals of Celebrity Masterchef and has recently been seen as a judge on the CBBC talent search Got What It Takes. Joining them as The Neverlanders will be the jaw-dropping acrobatic troupe The Timbuktu Tumblers. Presenting an incredible display of human pyramids, hoop-jumping and flaming limbo work, the team most recently starred in London’s West End in Cirque Beserk at the Peacock Theatre. Completing the line-up will be Sascha Williams as the Drunken Pirate. As part of the speciality act Rola Bola, the death-defying stuntman was most recently seen sailing through to the semi-finals of Britain’s Got Talent where he wowed the judges and audiences with his circus artistry of a ‘Rola Rola’ act. Having performed as part of Aerial Angels Australia and various circus troupes across the globe, Sascha also made his pantomime debut for Qdos Entertainment in Peter Pan. Produced once again by Qdos Entertainment, and directed by Michael Harrison for the ninth year, Peter Pan will bring all the laughter, spectacle, special effects and festive magic audiences have come to expect each year. Packed to the crows-nest with laugh-out-loud comedy, spectacular special effects, music, action and, audiences shouldn’t leave it any longer to hook tickets to Birmingham’s high-flying pantomime adventure. Peter Pan runs from Wed 19 Dec 2018 - Sun 27 Jan 2019. For tickets, call Information and Sales on 0844 338 5000 or visit www.birminghamhippodrome.com for details.